Outdoor unit for the production of chilled water with semi-hermetic screw compressor optimized for R134a, axial-flow fans, micro-channel full-aluminum condensing coils, single-pass shell and tubes evaporator designed by Mitsubishi Electric Hydronics & IT Cooling Systems S.p.A.
(brazed plate evaporator for sizes 0751 and 0851) and electronic expansion valve. Base and supporting structure and panels are of galvanized epoxy powder coated steel with increased thickness. Eurovent certification. KIPlink - Keyboard In Your Pocket - is the innovative user interface based on WiFi technology that allows one to operate on the unit directly from the smartphone or tablet. Using KIPlink, it is possible to turn the unit on and off, adjust the set-point, plot the main operating variables, monitor in detail the status of the refrigerant circuits, the compressors, the fans and the pumps (if present) and display and reset the possible alarms. In addition to or as an alternative, the Touch interface, with a 7” WVGA colour display and a front USB port, or the Large keyboard, with a wide LCD display and led icons, are available. The temperature control is characterized by the continuous capacity modulation, based on PID algorithms with dynamic neutral zone related to the leaving water temperature. The diagnostics comprises a complete alarm management system, with the “black-box” (via PC) and the alarm history display (via user interface or also PC) for enhanced analysis of the unit operation. Optional proprietary devices can perform the adjustment of the resources in systems made of several units. Consumption metering and performance measurement are possible as well. Supervision can be easily developed via proprietary devices or the integration in third party systems by means of the most common protocols as ModBus, Bacnet, Bacnet-over-IP, LonWorks. Compatibility with the remote keyboard (up to 8 units). The programmable timer manages a weekly schedule organized into time bands to optimise unit performance by minimising power consumption during periods of inactivity. Up to 10 daily time bands can be associated with different operating set points. As an option (VPF package), the modulation of capacity is integrated with the modulation of the water flow, by means of inverter and dedicated resources for the hydraulic circuit. 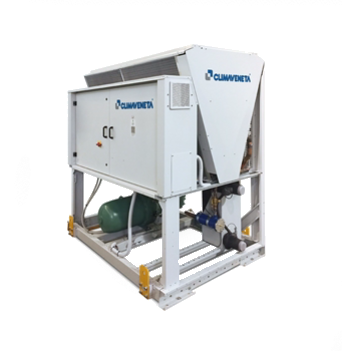 Very high efficiency at full and partial load, at the highest market levels, thanks to the adopted technological solutions. These units ensure low operating costs and therefore a quick payback time. As the result of a systematic design oriented to minimize the noise level, the silenced version units give the best combination of quietness and efficiency on the market. Flexibility in the applications thanks to the many configurations and versions available. with accessories) of evaporator leaving water temperature. The built-in hydronic group (optional) includes the main water circuit components. It is available with 1 or 2 pumps, fixed or variable speed, high or low head to satisfy all the different industrial and comfort application requirements. Set-up for remote connectivity with ModBus, Echelon, Bacnet, Bacnet over-IP.